Устройство сделано в стиле представленных в этот же день телефонов Pixel. Надо заметить, выглядит оно немного привлекательнее аналогичных предложений от Apple и Microsoft. 12.3-дюймовый экран поддерживает сенсорный ввод, в том числе при помощи продаваемого отдельно стилуса. При желании экран можно полностью перевернуть, чтобы использовать Pixelbook в качестве планшета, а не только ноутбука. Главный способ связи с миром: сети Wi-Fi. Сканера подушечки пальца нет, как и других подобных современных штук, так что единственный способ защиты данных - пароль. Продажи в Канаде и США начинаются с 31 октября по цене от 999 долларов США. Ориентировочная российская цена зависит от многих факторов, мы бы оценили её в диапазоне от 54 до 69 тысяч рублей. Стоит заметить, что хромобуки в данный момент вообще очень непросто встретить на территории бывшего СССР, и именно Pixelbook с большой вероятностью позволит организовать громкое пришествие Chrome OS на российский рынок. Если, конечно же, отпускная цена не будет слишком завышена. The way we use technology has changed so much over the past 10 years. We live online. We use tons of apps every day. We create and collaborate more than ever, and we’re constantly jumping across all our devices to get things done. But while the way we use technology has changed, our laptops haven't really kept up. They don't run many of the apps we use and love on our phones. They're not as portable as tablets. And they’re not always as versatile and helpful as they should be. With Google Pixelbook, a new high-performance Chromebook, we're hoping to change this. 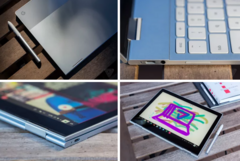 We’ve worked to combine the best parts of a laptop, a tablet, and a smartphone, to fit how we use technology today. Pixelbook comes with premium hardware; the speed, simplicity and security of Chrome OS; the smarts of the Google Assistant; and all your favorite apps on Google Play. Pixelbook is the thinnest, lightest laptop we’ve ever made, at just 10.3mm and 1.1 kilograms. It has a 4-in-1 design, so you can do anything you want with it. 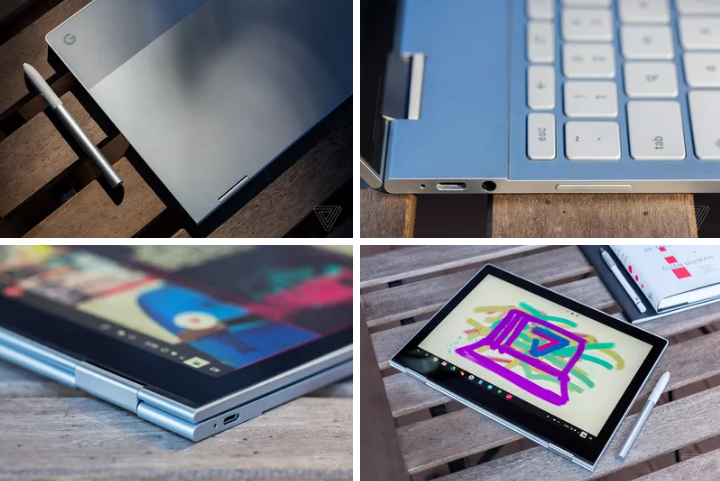 You can use it as a laptop, fold the keyboard underneath to easily watch your favorite show, read your favorite book or take notes in tablet mode when you’re on the go, or prop it into tent mode as you follow along with a recipe in the kitchen. The 12.3-inch high-resolution touchscreen display brings you vibrant colors and enough brightness to use outside, even on a sunny day. The thin keyboard is comfortable to use, with soft-touch keys and a backlit design that helps you work anywhere. The trackpad uses new, special touch-processing algorithms to make sure you can navigate with accuracy. Pixelbook starts up in seconds, stays fast throughout the day, and won’t slow down over time. Chrome OS provides a more secure computing experience, with multiple layers of security and automatic updates. Pixelbook uses Intel® Core™ i5 and i7 processors and plenty of RAM to smoothly handle your multitasking needs. With storage options up to 512 GB, you can store documents, movies, music and apps, and Google Drive will sync your most recent Google Docs, Sheets and Slides to your device, so you can keep working and watching even when you’re offline. Pixelbook’s battery lasts up to 10 hours and if you run low on juice, 15 minutes of charging gets you up to two hours. You can also use your Pixelbook charger with your Pixel phone, giving you one less thing to carry around. Alongside Pixelbook we’re introducing the Google Pixelbook Pen, a smart, responsive stylus which gives you a natural and comfortable feel when you are sketching and writing. Pixelbook Pen uses machine learning for handwriting recognition, and we’ve reduced latency to just 10 milliseconds—so it feels as fast as writing with a pen on paper. It also has 60 degrees of angular awareness and 2,000 levels of pressure sensitivity, so it’s fast and responsive and naturally follows your hand movements. Pixelbook is the first laptop with the Google Assistant built in. Just say “Ok Google” or press the dedicated Assistant key, and you can talk or type to find answers or perform tasks. You can set a reminder, check your commute, look up a basketball score, open a new document, or find an email. Just like you can with your other devices, your Google Assistant gives you hands-free access to your music and entertainment and allows you to control your smart home to turn up the thermostat or turn down the lights. You can also use your Pixelbook Pen to get help or take action on what’s on your screen—just press and hold the button on your Pixelbook Pen and circle an image or text. You can look up words, find out more about a picture, add an event to your calendar, and more. It’s not just the Assistant that makes the Pixelbook a more helpful laptop. For example, when you don’t have access to WiFi, Pixelbook can automatically connect to your Pixel phone’s data. And you can ask your Google Assistant on Pixel to send an email to a colleague when you’re out and about, and then ask it to find their reply on your Pixelbook when you get back to work. You can download your favorite apps on Google Play for Pixelbook, so you don’t have to switch between your phone and your laptop. For instance, listen to Spotify or use Adobe Lightroom to edit a photo before you post it to Instagram or Snapchat or play games like Asphalt 8. You can even download Netflix to watch your favorite series both online and offline. Pixelbook Pen is also great for drawing and designing in your favorite apps. Illustrate with Infinite Painter, design with AutoCAD, or jot down thoughts with Squid and Evernote. You can even take notes right from the lock screen with Google Keep. Pixelbook is available in three configurations starting at $999 in the U.S., so you can choose the processing power, memory and storage you want. The Pixelbook Pen is $99. Both will be on sale at the Google Store and major retailers, including Best Buy, in the U.S., Canada and the U.K. Pre-orders start today. So that’s the Pixelbook—a radically helpful laptop that’s designed to better fit how you work, play and create. To find out more, visit g.co/pixelbook.